The best things in life are free. Agree or disagree? 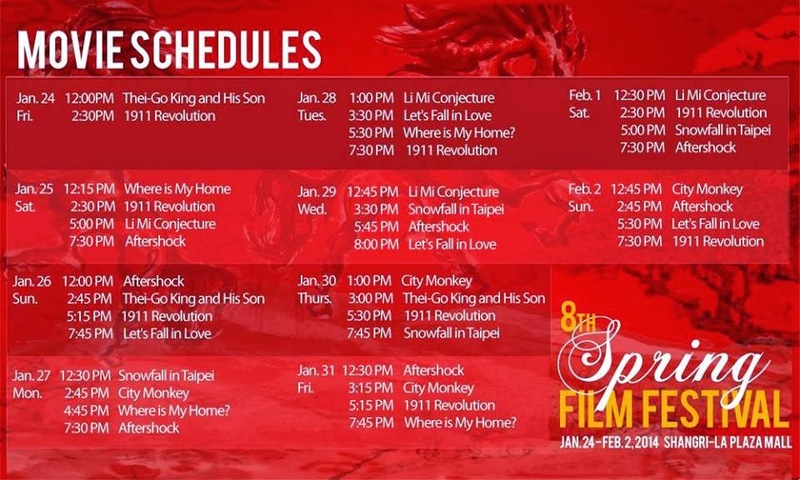 Free movies are up for grabs at the 8th year of Ateneo de Manila University Ricardo Leong Center for Chinese Studies and the Ateneo Celadon's sponsored Spring Film Festival. Yehey! Admission is free and on a first-come, first-served basis. May, a singer from mainland China, suddenly lost her voice and had conflicts with Ah Lei, her producer and secret lover. In anger, she came to Old Town of Jingtong where she met Xiao Mo, a warmhearted man. Xiao Mo helped May find a dwelling place, and introduced her to work at a local restaurant. Thanks to their constant contacts, they made a good impression with each other. May found happiness and consolation from the old streets of the small town, and her voice was getting better and better. However, May had left her heart at another place. Gradually, Xiao Mo understood that when one deliberately disappears, one wants to be looked for by others. Along with a sudden appearance of Jack, a muckraking journalist, the situation began to develop towards the uncontrolled direction. He Zhipeng is a senior student in high school who lives in a big old Beijing hutong yard with his mother and grandmother. He loves parkour, an extremely dangerous sport in most people’s eyes. With his good psychology and physique, he becomes the star player of “City Monkey” parkour club. But his mother strongly disapproves it and hopes he could focus only on his entrance exams to university. Clashes of different concepts, rebellion of the youth, and persistence to the ideal are unavoidable problems for them. What would the two generations do? Tangshan, 1976. Two seven-year-old twin children are buried under the rubble of the devastating earthquake. The rescue team explains to their mother, Li Yuanni that freeing either child will almost certainly result in the death of the other. She is forced to make the most difficult decision of her life and must choose between her children. Li Yuanni has no idea that her decision is overheard by her daughter Fang Deng, the female twin. Although she has been left behind as dead, the little girl miraculously survives for several more days before being pulled clear by another rescue team who believe that she is simply a corpse. She wakes up in the pouring rain next to the dead body of her father. Suffering from the emotional shocks of the disaster and the painful memory of her mother’s choice, Fang Deng refuses to reveal her identity. She is adopted by a middle-aged Chinese couple and years later moves to Canada to marry. Shadowed by the traumatic experiences of the earthquake and devastated by her mother’s decision to abandon her, she continues to be emotionally withdrawn throughout her adult years. Mrs. Geng is a simple village mother who raised two children on her own. Her son made his way to the city and offers to have her come live with him and his family. Despite the improved material conditions of the city, Mrs. Geng cannot help feeling isolated and lonely. It takes some time for her children to understand how she feels, and they rebuild their family’s affection. Liu Yishou, an amateur Go player, is called by his friends “the king of Go”. Liu Yishou has been laid off quite a long time ago and now, with no other skills to make a living, teaches Go in a humble training course for children. Life has been hard, and his wife has decided to divorce him. His young son, Xiaochuan, has chosen to stay with him through his difficulties. On an unexpected occasion, Xiaochuan displayed an amazing talent for Go, and his father vowed to support him to further develop his gift for the game. They confronted challenges, but with courage, persistence and profound love between father and son, they eventually arrived at the destination towards which they were heading. As the country enters the new century, China is facing a crisis. Two warring factions have emerged, starvation amongst the citizens is rampant and political reforms have made matters worse. The seven year old Emperor and his mother, Empress Dowager Longyu (Joan Chen), are out of sync with people’s needs after 250 years of total power. As Huang Xing (Jackie Chan) arrives from his studies on modern warfare in Japan, he finds himself picking up his sword to lead a rebellion against the powerful Qing Dynasty and the New Army. Tan Momo, who showed his natural gift in music in his childhood, entered the Conservatory of Music to learn to play Guqin (seven-stringed plucked instrument) smoothly. His teacher placed great hopes on him and his girlfriend Xia Fei had the greatest esteem for him. Upon their graduation, Momo, Xia Fei and other young people who cherished dreams finally walked out of the campus and began to experience the ups and downs in real life. While in front of conflicts between their ideals and family relation, love and morality, what would they choose. Due to the intervention of her parents, taxi driver girl Li Mi had to break up with her long-term boyfriend, Fang Wen, who had disappeared from her life yet seemed to remain connected. For four years, Li Mi had continued to search for his whereabouts in a constant tug-of-war between hope and despair. An eerie murder was witnessed, leading her to a man nearly identical to her missing lover. Could he be the one she has been looking for? Her life suddenly changes. Then come terrible yet pitiful drug dealers, and irascible but highly duteous police detectives. Behind the cascades of mysteries, compromises lie still between those who were once in love. 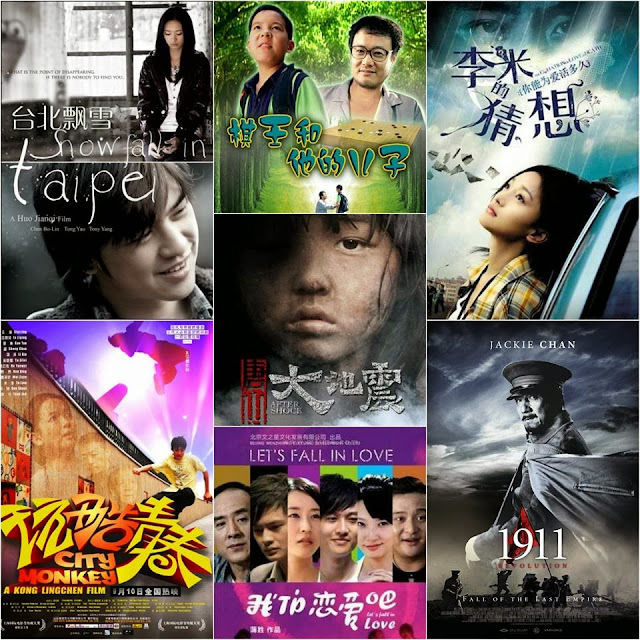 All movies are in Chinese with English subtitles This will give you and your children a glimpse of the Chinese culture while enjoying Chinese quality films. I am so excited! I couldn't wait for the festival to start. Please share with your facebook friends, twitter and instagram followers!